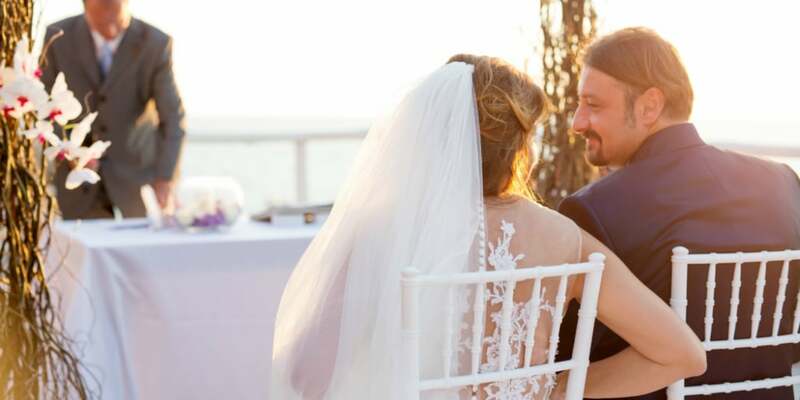 Getting married in Capri with a symbolic ceremony is the most common choice for couples who desire a stress-free celebration of their special day without thinking about documentation and paperwork. The couple can get married with a civil ceremony in their home country, and have a symbolic wedding of their dreams in Capri. A Symbolic ceremony (also called non-denominational or secular wedding ceremony) is not legally binding, providing tremendous flexibility for the location and style of your ceremony. Options for where to get married on the island of Capri are virtually unlimited. You can decide to tie the knot among nature at the highest point on the island reachable by chairlift, on a boat in the middle of the sea, at a rustic vineyard, in a secluded garden with a marvellous view, in an historical forest location overlooking the sea, at an ancient cloister, in an elegant and lavish hotel right in the centre of Capri, with an astonishing panorama of the Gulf of Naples surrounded by hundreds of different type of blossoms and trees typical of the Mediterranean region, under a lemon grove, beneath a pergola of an enchanting private villa, at a cool beach club enjoying a dramatic sunset, or any of a number of other possible locations. You can also decide to get married with a symbolic ceremony at a variety of locations approved by the local municipality. For a complete list we invite you to have a look at our VENUE section. You can personalize your ceremony as much as you wish. The format can be formal, creative, traditional, spiritual, or anything else of your choosing, according to your individual wishes, background, and values. Any officiant can perform your ceremony, including a family member or a friend. We can help you craft the script for the ceremony, including poems or prayers that are especially meaningful to you, readings from relatives and friends, and much more. Your symbolic ceremony in Capri will be amazing, and we thrive on creating an unforgettable experience for you and your guests. You can expect thorough and tailor-made assistance from us along the way. We will propose the best venue options, help you select the right officiant to perform the ceremony, guide you in the choice of the rituals and texts to create your perfect ceremony, advise you on readings and music, design a handsome paper certificate hand-made in Amalfi that will forever provide a treasured memory for you, and much more.